Noel Callan has been in prison for 28 years for the murder of Garda Sergeant Patrick Morrissey. A MAN WHO has been incarcerated for 28 years for the murder of a garda is eligible for remission, a Supreme Court judge has said. Noel Callan has been in jail since the 27 June, 1985, for the capital murder of Garda Sergeant Patrick Morrissey, after a robbery in Ardee, Co Louth. Callan was 22 when the incident took place. In court, Morrissey was described as emerging as “a courageous, indeed heroic, servant of the State”. Callan’s imprisonment under sentence of death lasted from 3 December 1985 after his conviction and sentencing until 29 May, 1986. His death sentence was commuted to penal servitude for 40 years. In 1997, penal servitude was abolished and replaced with imprisonment, meaning he has been imprisoned since 1997. Callan claimed he is undergoing a sentence, and contended that he is a person who should be treated as undergoing a sentence of imprisonment. A person undergoing imprisonment is, by law, entitled to remission of his sentence. The State’s initial defence was that the President had commuted the death sentence to penal servitude on condition that the “full sentence of forty years” would be served without remission. On the third day of the hearing, the State put forward a new case and contended that Callan was not serving a sentence but a “commutation”. It said this meant he was outside the scope of the prison rules. Mr Justice Hardiman said in his judgement that though the State said that Callan “is a prisoner ‘serving a commutation’”, he believed that “in terms of logic, law and language, this is nonsense”. In Ireland at the relevant time (December 1985) the Court was bound to impose a death sentence on conviction of capital murder. The President was bound to commute that sentence if so advised by the Government. It is clearly appropriate to describe the period of incarceration to which the appellant was condemned by the commutation by Act of the President on the advice of the then Government, as a sentence. The State itself so described it and resiled from this description only after it discovered that neither the Government nor the President had specified that there was to be no remission. But this has nothing to do with whether the forty year period is a “sentence”. Judge Hardiman noted that “all prisoners sentenced to Penal Servitude for forty years since 1982 apart from three, one of whom is this appellant’s co-accused, have in fact been released by executive action”. The Judge said that he had no doubt the prisoner “is presently serving a sentence of imprisonment”. That the plaintiff is a person who has been sentenced to a term of imprisonment exceeding one month and is, therefore, eligible, by good conduct, to earn remission under Order 59(1) of the Prison Rules 2007 and is also a person to whom the provisions in respect of the possibility of greater provision, found in Rule 59(2) of the Prison Rules 2007, apply. Email “Man jailed for garda's murder 'eligible for remission'”. 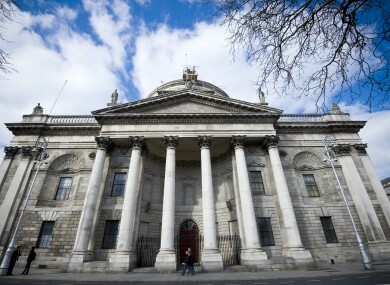 Feedback on “Man jailed for garda's murder 'eligible for remission'”.